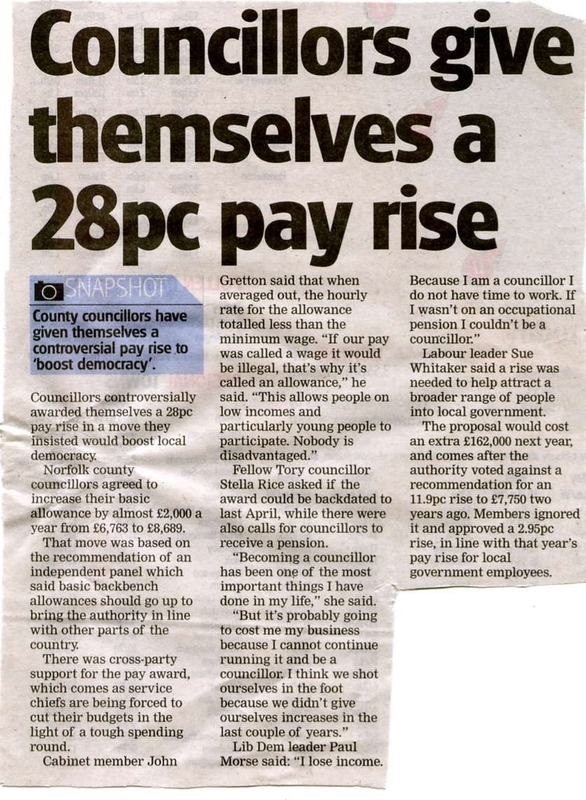 TPA activist Barbara Lockwood, who also organises a local campaign against council tax (known as FACT), has informed us that Norfolk’s county councillors are increasing their pay by a whopping 28%, roughly an extra £2,000 – of your money in their pockets - a year. Just for comparison, the average rise in private sector pay has risen by around 4% and the government have pegged the rise in public sector pay to 2%. Yet again there’s one rule for the politicians and another for taxpayers. Yet it’s striking that Councillor Sue Whitaker says more money is needed to attract people into politics. But that’s exactly what we don’t need; we don’t need more snouts in the trough and people motivated by the money in politics and not ideals! Whatever happened to principle, civic pride and community service as being they key driver of political involvement, Councillor Whitaker? Please make your voices heard by holding these politicians to account. Write to the leader of Norfolk County Council, Daniel Cox, at daniel.cox@norfolk.gov.uk and ask him why Norfolk County Council deserves more of our money and where they’re getting this money from. If you get a response, let us know so we can publicise their excuses. Do be on the look out for more stories like this as councils begin to admit how much your council tax will have to go up next year to pay for their extravagancies. It’s up to us to fight back and hold these over-spending politicians to account!